Anyway. I feel all sleepy warm and cuddly today, so I thought today would be the perfect day to feature one of the cutest pair of slippers I've ever seen. I found these little slippers on Craft Gawker, actually. And I have to agree with them that the picture is spectacular! 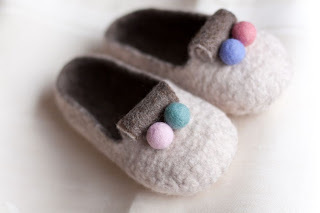 They're hand felted for a little girl, made in dream pastel colors from 100% merino wool and decorated with felted pompoms. She really needs to make some more of these! She also has a felted scarf over there that I'd just love to have. The shop in question, of course, is Daimblond's Boutique. 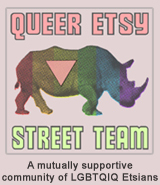 It's filled with a variety of different pieces from felted items to jewelry and more! The owner, Elena, is a Moscow born university educated designer who is currently living in France. She loves to experiment with different materials and her shop has some truly unique pieces that show just that. YOU CAN CLICK ON THE PICTURE ABOVE TO VISIT DAIMBLOND'S SHOP OR, IF YOU PREFER, CLICK RIGHT HERE. You always find such cute things! How cute are those . . .
Those look so soft and warm! Looking at them makes me want to walk around in a robe all day armed with a good book and a mug of cocoa. Those shoes are adorable! I felted some shoes for my daughter before she was born, but I thought baby feet were a little smaller and they did not fit her! they are so cute! I especially like the pompoms!